Politics Makes Strange Bedfellows: Isaias Afeworki Pandering to CUDP? After extracting his country (Eritrea) from the jaws of Ethiopian colonization after 30 years of liberation struggle, Isaias Afeworki says he strives for unity of the empire he separated from not very long ago. “One Ethiopia” is produced by the Eritrean Ministry of Information in the English, the Amhara and the Tigre languages, and distributed in the Diaspora by Eritrean embassies. Even before one gets to read the content of “One Ethiopia”, a single glance at the cover page and one is left with no doubts as to the message the magazine intends to impart to the reader: Ethiopia’s unity and territorial integrity. Looking at the graphics and the caption on the cover page, if you did not know what Isaias looked like, you would think he were the leader of one of the Ethiopian opposition parties like the CUDP for whom Ethiopian unity is euphemism for Habasha hegemony. Go ahead, open the magazine and look at the inside page of the cover. 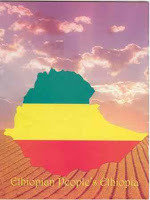 A map of the Ethiopian empire, adorned with the green, yellow and red of the empire’s flag with a caption reading “Ethiopian people’s Ethiopia” appears. The implication is that this is what the people of the empire would want to maintain. You would feel you were looking at an organ of, say, CUDP not at a magazine produced and distributed by Isaias and Co.
No don’t read the magazine. Not yet! Don’t even glance at the next page. Jump directly to the inside page of the back cover. 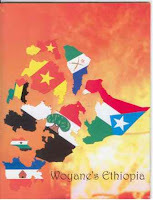 A map of the Ethiopian empire, partitioned into nine (9) separate territories with various flags and a caption reading “Woyane’s Ethiopia” appear on the page. Even Oromia, as we know it today, doesn’t appear as a contiguous territory. God only knows what Isaias meant by that! The intention here is to show the reader what would happen to the empire if it is to continue along the path the TPLF is taking it. Compare that with "Ethiopian people's Ethiopia" and what is implied is crystal clear. Now, close the magazine and look at the back of “One Ethiopia”. Prominent on this page is, again, a map of the Ethiopian empire adorned with the empire’s flag colors and “Ethiopia” inscribed in the middle. Just above the map appear pictures of Seyye Abraha and Hailu Shawel side by side. Seye Abraha, you may recall, is a former partner in crime of Meles Zenawi’s against the Oromo people and former defense minister of the Empire who was incarcerated for six years on corruption charges before he was released in July 2007. He is the man who led the TPLF army which decimated our freedom fighters while they were encamped in 1992. Hailu Shawel, of course, is the former leader of All Amhara People’s Organization and current leader of the most backward Ethiopian opposition party (CUDP) who would roll back all achievements made by the Oromo people over the last 30 years if given a chance. Given a chance, him and his party (CUDP) would partition Oromia into smaller “kifle hagers” and would sell off all Oromo land to the highest bidder just as the TPLF is doing at the present time. It is no brainer that Melles Zenawi, Seye Abraha and Hailu Shawul have no difference in their view of the Oromo question. No different from the message the covers portrayed. In this interview, Isaias Afewrki addresses many questions pertaining to the region in general, the Ethio-Eritrean conflict, the role of the US in the region and Somalia issues in particular. He rightly exposes the tyrannical nature of TPLF and the almost total control it is wielding on all aspects of life in the empire. I don’t believe it is lost on Isaias that this is music to CUDP’s ears. That TPLF’s mental instability is endangering the whole region, well beyond the empire’s boundaries, is no brainer and is widely acknowledged. However, it is not clear why Isaias Afeworki considers inclusion of self-determination up to secession in the constitution a dangerous political approach and why such a provision should be blamed for “ethnic polarization.” Unless, of course, the purpose is to pander to CUDP and the likes! What should the Oromo political party which he is currently hosting in his country, and who has repeatedly expressed the desire to make use of that part of the TPLF constitution, understand from this statement? That Isaias would sell them to the highest bidder? As a former colony of the same empire Oromos and others are struggling to free themselves from, one would have thought Eritrea would take a principled approach and support the decolonization struggles of those nations who are still suffering under the yoke of Ethiopian Empire. Instead, Eritrea’s leader chose to pander to a party with retrograde Amahara-centric agenda. Apparently, to Isaias “What is good for the goose is [NOT] good for the gander.” In other words, what is good for Eritrea – an independent state - is NOT good for Oromia. If unity and territorial integrity of the empire is to the benefit of the colonized nations and nationalities, then why did Eritrea fight 30 years to decolonize herself? It is the apex of hypocrisy to strive for a “unity” to which one does not want to be a party. Let us examine the remaining numbers in a descending order. What happens to the number 8 when we apply the above formula? Observe that for 8xN = XY where X+Y = 9 only when N = 9. For all other numbers, X+Y < 9 and the sum falls away in a decreasing order as N increases. (Figure II) for the Graph of 8 and learn how it is falling down one step at a time. Therefore 8 is a feeble number that can not be used in any of the Gadaa function and the Oromos named it as “Saddettan dhalaa Nenxaa” the gestation period of a lion. Let us take the next number, which is 6. Observe what happens if we use the formula as we did for the numbers 9, 8 & 7. 6xN = XY, where X+Y = 9 or X+Y < 9. Through this operation, this number merges to 9, when N = 9, 6 & 3. When N is a number other than 9, 6 & 3 the result falls away from the graph of nine in a descending order. See Figure IV for the Graph of 6 and learn how it is falling down double steps to reach its destination but only a single step to hit the graph of 9. Therefore, 6 is a medium number that can be used in the Gadaa function as a regional subdivision of Oromia (Biyyaa Oromo) and is referred to as “Jahan Jabbii Qaraxxaa”, the taxation which implies administration. A very strong and tangible proof for this scenario is that there are only six Odaa centers in Oromia. The six administrative (legislative) regions are Odaa Bisil, Odaa Bultum, Odaa Gaares, Odaa Makoodii, Odaa Nabee and Odaa Roobaa. What happens when we apply the above formula to the number five? Through this operation, the sum of X+Y for 5xN = XY approaches 9, after only five uniform cycles. When N is a number other than 9, the result decreases and increases in a uniform pattern. The Graph of 5 (Figure V) clearly illustrates this pattern. Therefore, 5 is a sophisticated strong number that is used in the Gadaa function as a judiciary group of Oromia and is referred to as “Shanan Qubaa harkaa”. Just as we have five fingers for effective coordination and five senses for absolute judgment the Oromos trust a group of five Abbaa Gadaas to interpret the law of the Land (Orimia). Observe what happens to the number 4 when we use the formula 4xN = XY, where X+Y = 9 or X+Y < 9. Through this operation the value of X+Y approaches 9, after only three cycles. As N increases (N = 1, 2,3…) the peaks of the three cycles fall away from the Graph of 9 in a decreasing order. However, when N = 9, the fourth peak merges with the Graph of 9 (Figure VI). Therefore 4 is classified as a weak number that can not be used in the Gadaa functions of Oromia (Biyyaa Oromo) and is referred to as “Arffan Muchaa Sayyaa”, the four teats on the udder of a cow. The number 3 is very fascinating. For 3xN = XY where X+Y=9 or X+Y < 9, when N= 9, 6 & 3, the peaks for the Graph of 3 touch the Graph of 9. When N is any number other than 9, 6 & 3 the sum of X+Y falls away from 9 in a descending order. Observe Figure VII for the Graph of 3 and learn how it is falling down in one shot (a fact that 3 is much stronger than 6) and rises up and touches 9 in two steps. Therefore, 3 is a powerful number that is used in the Gadaa function as an administrative and defense committee. The number 3 is classified as “Sadan Sunsummanii”, broad based. A very solid and tangible proof for this scenario is the term “Sunsumaa” which translates into the word “tripod”. Therefore, the Oromos fixed the number of council in the area of defense and administration to 3. Take the next number “2”. Observe what happens to the values for the formula 2 x N=XY, where X+Y=9 or X+Y < 9. The sum of X+Y reaches the Graph of 9 only when N = 9. See Figure VIII to learn that for all numbers other than 9, the graph shows one cycle, which rises to its peak in three steps and falls off to its lowest value in just one step. Therefore 2 is a feeble number that can not be used in any of the Gadaa function and the Oromos named it as “Laman Muchaa Re’ee”, the teats on the udder of the she goats. The last number is 1. One does not change the value of any number that it is multiplied with (1xN = N). As N increases (N = 1,2,3…) the Graph of 1 approaches the Graph of 9. Therefore 1 is an impotent number that can not be used in any of the Gadaa functions and the Oromos refer to it, as “Tookken Tookkituma”, one is always one. I hope you enjoyed reading this excerpt as much as I did. Do you wonder where the Oromo sayings like Salggan Yaa’ii Oromoo, Saddeettan dhala Neencaa, Torbban naannoo dilbataa, …, tokkeen tokkittuma came from? Why is Yaa’ii Oromo composed of nine and why is Oromo jury composed of five? According to Obbo Aanga’aa Dhugumaa, “numbers vibrate power and love” and can be categorized as strong or weak based on how they behave when multiplied with other integers from one to nine. Gadaa attaches significance to whether an integer is strong or weak when making use of it. The following is taken from Obbo Aanga’aa Dhugumaa’s article titled “The Need to Move On” written June 24, 2007. Apologies for the missing figures (graphs) as this blogger has not seen them himself. However, he doesn’t suppose they are difficult to imagine while reading the explanations or make rough sketches of them. This blogger knows nothing about this subject but found Obbo Aanga’aa’s take on it interesting and fascinating so much so that he decided to share with his readers. Excerpt from "The Need to Move On"
It is a prerequisite to know the definitions of all positive integers from 9 to 1 before going into the theories and practices of Gadaa, a simple method of democratic governance of the Oromos. It is a democratic system that has been in place for more than 1,000 years. However, an Oromo prophet (Rajii) called Makoo Bili revised this democratic system some 500 years ago. Unfortunately at the beginning of the 20th century the Abyssinian autocrats, during the scramble for Africa started suppressing this system. Oromos use “9” for supreme council, “5” for jury, and “3” for war leaders and administration. It should be understood that numbers vibrate power and love. Let us take the numbers one by one and study their meaning and assignment to the Gadaa functions by using graphs adopted from mathematical formula called (dhaa) in Afaan Oromo. The number 9 is defined as the sum of Oromo supreme councils of representatives, commonly known as the “Salggan Yaa’ii Boorana” or Salggan Yaa’ii Oromo. When I was a child, my elders told me that all numbers were defined by a theory known as “Dhaa” to the Oromos. Although it is subject to further investigation, I believe that dhaa is a form of mathematics based on asymmetrical philosophy. The dhaa defines that nine is the strongest of all the numbers. Refer to figure I to understand more about the number 9. In the Oromo culture blessings are repeated three times in order to make the good wishes come true. It is the belief of Oromos that Waaqaa (God) recognizes your prayer if it is accented this way. Let us follow a systematic approach to all the numbers from 9 to 1. The equation that follows is used to compare the characteristic nature of all numbers. One says Buli Buli Buli in the Oromo blessing. By the same analogy one can say 9, 9, 9. Now we consolidate them (Gumeesi), i.e. 9 + 9 + 9 = 27 (9x3 = 27). We need to further consolidate the product until the sum becomes a single number, i.e. 2 + 7 = 9. This suggests that nine is a strong and powerful number that does not lose its identity no matter what it is multiplied with, as long as the number is positive and whole. Thus, proving, the number 9 is associated with positive and wholesome concepts. From this analogy I formulated that 9xN = XY where X + Y = 9. Where N is any positive integer from one to infinity (Figure I). The graph of nine is a strait line regardless of the value of N. Due to its characteristic nature that nothing changes the number 9, it is chosen as the number of supreme council to govern Oromia. It is named after Boorana or Oromo, the man who first implemented it as an Oromo system of governance over a thousand years ago and revised by a prophet (Rajii) named Makoo Bili some 500 years ago. In its Aug. 15, 2007 program, VOA reports on what is going on in Horoo Guduru where our people are being herded in to concentration camps under the pretext of supporting and aiding the OLF and ONC. Faantaanesh Tasfaa‘s husband, Fiqaaduu Gaaddisaa a business man from Harato town, Jimmaa Gennetii district, is one such victim of the TPLF regime. Fantaanesh describes the circumstance of her husband’s arrest as follows. A government employee who lives around Shaambuu town but does not want to be identified for fear of repercussions says: what is happening in Jimmaa Genetii district is not an isolated incident. Similar incidents are taking place in most of the Horro Guduruu zone of Wallaga. Listen to that segment of the VOA interview HERE. Cry my beloved Oromia! Rise, my beloved Oromia to undo this injustice that the minority is inflictiing on your sons and daughters! In its press release disseminated on Aug. 16, 2007, the OLF Executive Committee [TA-OLF] informed its readers that the case against it, filed in a MN court on July 19, 2007 by the Asmara group, has been dismissed “without prejudice.” Dismissal without prejudice is "when a case is dismissed but the plaintiff is allowed to bring a new suite on the same claim". In other words, the Asmara Group may file the same law suite again if they so wish. According to this press release, the case was dismissed “after two days of court appearances” and “before the originally planned hearing date of 16th August 2007.” However, the press release did not explain the legal basis for the dismissal. Claiming it was forced to speak out on this issue to counter what it called “the continuous misinformation that has been disseminated by the Asmara Group” regarding who initiated the court case, TA-OLF said it was “forced to mount a defense as the law of the land requires” only after the Asmara group filed a complaint against it. The press release concluded by thanking its members and supporters, and also by calling on members of the Asmara Group OLF “to do the dignified thing and say enough is enough” to the Asmara Group and join the TA-OLF. This blogger received news of the dismissal with relief. In this blogger’s opinion, no interest of the Oromo people can be served by wasting time and other resources on taking another Oromo organization to court. It is not the time for Oromo political forces to take their brethren to courts, but for them to take Meles Zenawi and his cronies to court. Neither is it the time to waste thousands of dollars on lawyers for something no legal solution can be found. Even if the MN court had confirmed one of the groups as “OLF” what good would that be if the Oromo people do not accept that group as OLF? Why not wait for the Oromo people’s ultimate decision? Meanwhile, if there is money to be spent, please spend it on our refugees in East Africa whose suffering is known to everyone. There are other worthy causes to spend money on than lining up USA lawyers’ pockets. Never mind how you got there - you are now at the helm of state power. You may have gotten there thorough the barrel of the gun or through popular elections which you have even lost. Or you may have used both methods at different times to acquire and retain power. You have no political philosophy. You are neither a democrat, nor a nationalist albeit you make use of these labels when they serve your purpose of hoodwinking others. Come hail or high water, what matters to you the most is to hang on to state power for as long as you possibly can. Here are a few rules of thumb and best practices in no particular order. You are the last and the only hope: Ensure that you do every thing you can to propagate the belief that you are the last and the only hope for that country’s peace, development and stability. If you were to be dethroned (God forbid! ), the country would plunge into chaos; ethnic strife will ensue; famine will devour the whole population of the country and refugees will stream out of your country and become a burden on the international community. Nothing you do will get you more international support than selling this belief to the West. If you have to encourage ethnic strife in the country to make your point to the West, so be it! What are a few thousands of human lives to you anyway? Remember, you are working for a higher cause which is to hang on to power at any cost. Remember, you are a tyrant. Swear by democracy: Be smart enough to be aware that democracy is the most accepted and supported form of government in the world today. While Tyranny is in the best interest of you and your group, it has its detractors. Condemn tyranny at every opportunity. Swear by democracy. Utilize every opportunity you get to pledge allegiance to democratic principles. In every communication you put out, claim that you are guided by democratic ideals. Even allow some form of legislative assembly. Pay lip services to democratic processes and periodic, free and fair elections. Never mind that you have been in power for almost two decades with no measurable progress toward a democratic governance, and that it will take a millennium to get there at the pace you are going, be quick to point out that democracy takes time to take root. After all, this is Africa! Keep repeating that for decades to come because there is nothing the West understands better. Always remember that, regardless of what they say in public, in private, the West does not believe Africa is ready for democratic governance. You are the Law: Rule of Law!? What law? You are the Law! Your rules are the rule of law. You are not subject to the law of the land; period! Other citizens are. Simply displeasing or annoying you, not to speak of challenging your authority should be grounds for punitive actions against your subjects. The police and the military are your indispensable tools in this regard. Make sure you gain and retain their complete control. Intimidate the judiciary. Because they depend on you for their livelihood, if you don’t pay their salaries, they have no way of raising their kids. That is your leverage over them. The few that defy you, force them into exile or arrest them. Make life miserable for them and their loved ones. Requirements of rule of law like legal culpability, universality and impartiality of the law apply only to democracies; NOT to tyranny. Don’t forget to institute a rubber-stamp public legislature. The constitution? Forget the constitution! You are the constitution. If you are constrained from taking action by the constitution, your tyranny cannot survive. Human rights? What human rights? “Might makes right!” Arrest and harass the populace to instill fear in them. Repression is your best friend; repress them in any way you can. Murder them at your will if you suspect they think they have any rights. The rights are all yours, NOT theirs. Make sure you close down all independent human rights organizations in the country. The likes of Amnesty International and Human Rights Watch are good for nothing. So is ICRC. No matter how much they helped take your plight to the international community when you were at the receiving end of human rights abuses, they are now NOT to be listened to. They are sworn enemies of tyranny and by extension your foes. They smear your name in international circles. Drive them Out: Make sure you send the leaders of your opposition in to exile where they are far removed from “poisoning” the minds of their constituents. There are many ways you can do this. If they are already outside the country, then charge them with some concocted outrages crimes in their absence; preferably ones that carry maximum life imprisonment or capital punishment. That way you will intimidate them in to remaining wherever they may be. If they dare to turn up in the country, then arrest them and make life miserable for them and their loved ones. To those who are in the country, make an offer of peaceful exit. If they dare turn down your “magnanimous” offer, arrest them and make life miserable for them and their loved ones as well. Drag them by their collars in to your kangaroo courts; deny them bail and find excuses to prolong their suffering by making the court process excruciatingly slow. If and when they do get to courts, make sure the presiding judge, or judges are loyal to you, NOT to the constitution. In case the judge(s) show independence, remove them from the case. That way they will return guilty verdict for which you will “pardon” the “convicts” to show your magnanimity to the entire world. Silence Free Press: Suppress free speech, arrest and harass journalists. Free press is an obstacle to your free will of doing what ever you like (legal or otherwise) to stay in power. If there is one group of professionals you must always keep in check, it is this group of “trouble makers.” They reach far and wide in search of your sins to expose. Free press as the “fourth branch of government” and “a necessity to any democratic society” applies only to democracies – NOT to tyranny which you are practicing. Clamp down on all their means of reaching the people and “poisoning” them with this idea that “the people have the right to know.” Newspapers, magazines, radio programs, the Internet are not neutral in the power struggle between democracy and tyranny. In other words, they are either with you, or against you. If they are not with you, close them down; block them; do whatever needs to be done to stop them from informing the public. “Sii shoom yaal ballaa, sii shaar yi qocawaal”: What good is political power if it is not used for gaining and maintaining economic power? Create a business conglomerate like “Effort.” Amass as much wealth as you can while in power. Sale off state industries for next to nothing to your companies. Give all government contracts to your companies. You have worked hard to get to power and is now your time to rip the benefits. Prepare for the inevitable: History tells us no regime lasted forever. The British and other powerful empires crumbled with time. It is only a matter of time, but you will fall too! When you do, you will fall harder. So, Make sure you are prepared for when it happens. Stash away enough wealth for the rainy day that is sure to come. Find some country that will receive you in case you get lucky and escape the wrath of your subjects. In an interview he gave to Oromo Community Radio on KFAI Radio without Borders 90.3 of MPLS – St. Paul, Nuro Dedefo confirms that the temporary restraining order against TA-OLF has been lifted, and that the Asmara Group of OLF is proceeding with the court case seeking permanent injunction against TA-OLF from using the OLF name, emblem and flag. According to Nuro Dedefo, who was introduced by the interviewer as chairman of the USA chapter of the OLF [Asmara group,] his group was forced to go to court because TA-OLF booked the same conference room which the Asmara Group had previously booked for their public meeting on July 27, 2007. He informed the radio audience that after appealing to the courts and obtaining a temporary injunction against TA-OLF, they [Asmara Group] failed to post the necessary bond as ordered by the court. As a result, the restraining order was vacated. Responding to Nuro Dedefo’s assertion on this matter, my TA-OLF contact had the following to say. This blogger wishes the interviewer had asked Nuro Dedefo how much Oromo hard earned dollars are squandered on bringing this case to the courts. Hopefully, TA-OLF will also give an interview and let us know how much they have spent so far to defend the case. It is to be recalled that Human Rights Watch (HRW) had reported the killings of Gemechu Benesa Bula and Lelsa Wagari Bula in Guyii on the evening of on January 4, 2007, by TPLF police and militia members. In a letter it wrote (read HERE) to Ethiopian Minister of Federal Affairs on Feb. 20, 2007, HRW had asked that the killings be investigated and the killers brought to justice. No investigation has been undertaken and the killers continue to roam the towns and villages of Oromia. Nick Wadhams of National Public Radio (NPR) traveled to Guyii and interviewed the parents of the murdered students. Please listen HERE to the full NPR report as broadcast on August 13, 2007. As always, have your say. In an interesitng article he wrote in July 2007 and posted HERE, Ibsaa Guutamaa weighs in on the The Asmara Group vs. TA-OLF court case and many other issues currently under debate in Oromo circles. One of the founders of the OLF, Ibsaa Guutamaa is widely recognized for the leadership he provided to the team that produced millions of school text books in Qubee Afaan Oromoo in 1991-92 while he was Minister of Education and the OLF was a partner in Transitional Government of Ethiopia. Ibsaa’s article begins with a brief introduction of how the Oromo failed under Abyssinia colonization. Then, it quickly moves to posing the often asked question “what do Oromo[s] want?”which he claims “arise from the mixed message and lack of clarity” of some so-called leaders who carry “two cards one for their freedom craving people another for donors who have interest in the status quo.” The “two cards”, writes Ibsaa Guutama, are the search for solution of the Oromo question within a democratized Ethiopia or in a free and independent state of Oromiyaa. "There are Oromo groups that would like to remain within Ethiopia whether others like it or not. They only pray to be tolerated by the Ethiopians. Among these are those with nostalgia for the emperors and the Darg’s era. Others are those promised benefits like land and positions if they join the regime. Still others are those who fraudulently joined the movement with a mission of wrecking it and burying the thought of independence ones and for all. Still others are the confused nationalists who had fallen victims to alien machination. All together they are not OLF but its zombie. They lack the soul and flesh of Oromoness. Hence cannot represent the OLF in any dealing. Above all no group that doesn’t show credibility and consistency of principle can represent its nation. There are those that remained with the kaayyoo and still have more claim of legitimacy than any one. As long as such credible groups exist and the desire for freedom is engraved on the[ir] minds, even of a small group, OLF can never phase out before the liberation of the Fatherland." "Many have abandoned Oromoo tradition of safuu. According to [Oromo Safuu] no Oromo shall expose other Oromo to alien scrutiny for individual or group benefit. But a case where compatriots were exposed to freely extract from them some fifty thousand dollars was observed. In the case against compatriots the OLF was presented as an economic firm. Members were presented as donors. The good will and the trust OLF accumulated over years as a result of the sacrifices comrades made was presented as an effort of the plaintiff group. This exercise by a group has cost both sides a substantial amount of money which could have been used for the struggle against the enemies of the nation. For the group OLF that upholds OLF programs as amended in 1998 are the principal enemy. So no wander if they prefer Ethiopia’s democratization over Oromiyaa’s independence." "Alien courts will not stand witness for our being OLF. OLF was born and registered in the minds and hearts of all Oromo and its rightful members, signed and sealed by those who paid the ultimate sacrifice. That is the evidence we carry with us all the time..."
NOTE: This blogger calls on other heavy weights of our struggle to follow Ibsaa's example and weigh in on this court case to inform the public.